A few weeks back I shared my experiences with making soap. At that stage I thought there was only really one method. How wrong I was! While Polly Pender’s 1983 publication seduced me into believing that soap making was easy-peasey, what with measurements in cupfuls and spoonfuls, and mixing with a whisk, I have since learned that there is a lot more science to soap making, and indeed, cold processing (a la Polly), is just one side of the story. The other side is hot processing which I decided to have a crack at on Tuesday. I had spent quite a bit of time gathering all of the ingredients, having set my heart on making a shampoo bar so I had to amass all manner of oils and butters from a selection of shops. The last ingredient, bee’s wax, I unearthed at the local markets on Sunday. So, on Tuesday, I took a deep breath and, with trusty crock-pot as the centre of the action I measured and melted the oils, combined the water and lye and then added the lye mixture to the oils, in the crock pot where I used a stick mixer to combine the ingredients until it thickened (this is called ‘come to trace’). The almost pudding like combo was then left covered, to cook on low. The site where I found the recipe recommended that you cook the mixture and don’t touch it and it ends up turning in on itself and becoming transparent. I have to say that the instructions were a little vague, and I was unsure as to what temperature to set the crockpot to, but ended up Googling mid-cook and decided that low was probably the go. It cooked but did not fold in on itself and it certainly did not look transparent, so I left it cook some more, and then some more, and then some more! It was supposed to take about an hour. I turned mine off after two, as it still had not done its tumbling-turning thing as suggested in the recipe. I took a spoon to it and it was a weird texture—a bit gelatinous but very light and almost fluffy in an oily kind of way. I was majorly disappointed. So I took it outside to cool a bit and then when I thought it was cool enough I added a goodly lug of sage oil. I must say that the cooked mixture up until this point did not smell the least bit appealing. As I mixed in the oil the mixture was behaving oddly and was kinda thick and bitsy. Dejectedly I spooned it into some silicone moulds, covered it, pouted a lot and walked away. I left it for a day and then turned the puck shapes out and wondered what went wrong. I have since watched a variety of hot process soap making vids on YouTube and I think that, in retrospect I wasn’t that far off doing a reasonable job. I think I should have had a smaller crockpot or a larger volume of mixture and I needed to attend to it, stir it while it was cooking—poke and prod it as was my instinct. The final seven lumps of ‘shampoo bar’ (ok they are pucks, not bars) look a little odd, a bit waxy to the touch and look like they may crumble. But when tested by my very own crash test dummy, Chris, the shape held together and lathered well and seemed to clean his hair just as well as shampoo. It did occur to me, after he used it that just maybe I should have tested the pH before I let him lather up 😀 So I did that today and the soap sits around 9.6 which is within acceptable range (anywhere from 7 to 10 is good). 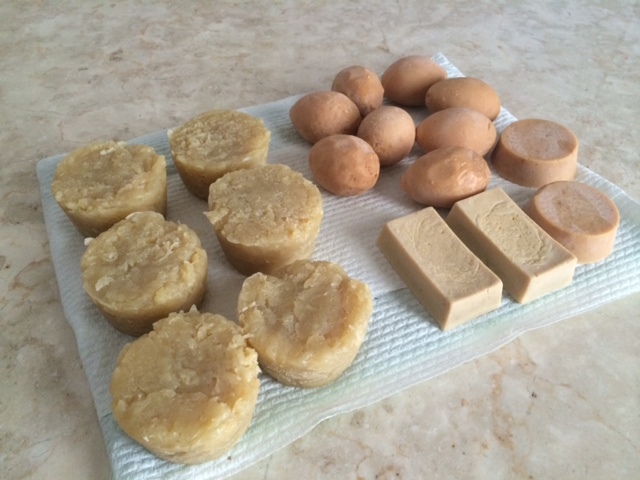 So tomorrow I am going to try hot processed soap again, but this will a lot less ingredients (I have created my own recipe via the soap calculator (http://soapcalc.net/calc/SoapCalcWP.asp)—I will attempt a rice bran oil–coconut oil combo with some milled oat bran for texture and vanilla for fragrance). My soaps so far: shampoo soap bar (pucks); spiced egg soap, and two bars of sage and cucumber soap.